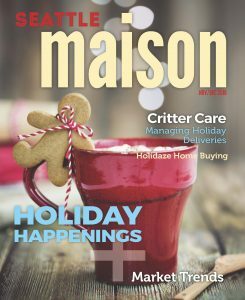 The Holiday Happenings issue of Seattle Maison is quite special! I think this is my favorite issue of 2016. Articles cover interesting holiday topics like The PNB’s The NutCracker by the numbers (guess how much snow is used in the Act 1 snow scene! ), how to care for your pets during the hustle and bustle of the season, and on-trend gifts priced at $50 or less. There’s a guide to fun holiday events occurring around the Puget Sound Region. There is even an informative article discussing why making a home purchase during the holiday season can be a boon for buyers. I hope you have been enjoying Seattle Maison magazine. I look forward to sharing it with you during 2017. If you would like to be the first to read it, send me an email at kathryn@windermere.com and I’ll subscribe you Seattle Maison for next year. Cheers!